The most valuable thing in the world is trust. When you are trusted, there is no limit to how far you can go. Our "certified by…" statements are designed to help you achieve a reputation that is sterling, and to strengthen your business, career, and personal relationships. These statements can be used on your web site, business card, signs, advertisements, resume, letterhead or for any other marketing or public relations purpose, and in personal matters as diverse as college applications, requests to rent a house or apartment, job applications, marriage proposals or any other situation in which trust affects outcome. We offer two levels of certification: "Certified," which requires a score of 70% or more, and "Top Rated," which requires 90%. 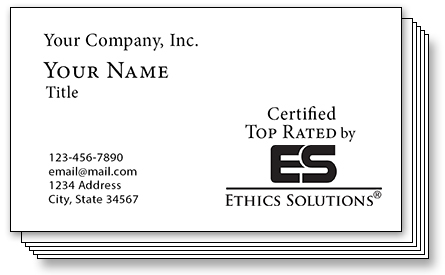 Certified entitles the one to use the ES logo and the statement, "Certified by Ethics Solutions®." This makes you stand out from the crowd. Top Rated enables you to use the logo and, "Certified Top Rated by Ethics Solutions®." This puts you head and shoulders above the rest. 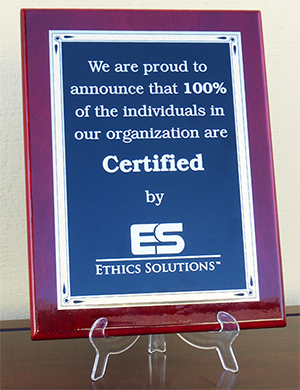 "We are pleased to announce that XYZ Building Contractors has been certified by Ethics Solutions®." "ABC Stock Brokerage, certified Top Rated by Ethics Solutions®." 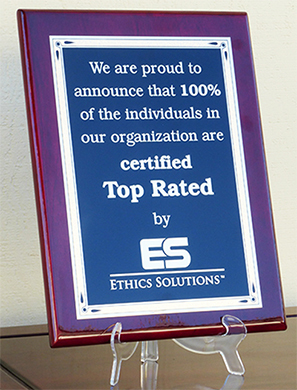 "We proudly announce, the Johnson family is Top Rated by Ethics Solutions®." Certification is good for three years, and then can be renewed by retaking and passing the assessment. You are permitted to print out as many copies of your Certificate of Completion as you like. We suggest you frame and display them in your workplace, home and wherever else you think is appropriate. When you are ready to begin displaying the Ethics Solutions® Logo, please email us at By return email we will send you the Ethics Solutions® Logo Kit at no charge. It contains an assortment of ES logo image files, sample business cards demonstrating placement of ES logo and certification statements, and a template for card design. Please include your contact information and, for our marketing analysis, a brief description of who you are and your plans for using the logo. This is for our internal use only, we promise to keep it confidential. Tell the world you are different, you understand ethics. Contact customer service today to become ES certified. Our certification course takes only about three hours.